Another year has come and gone. 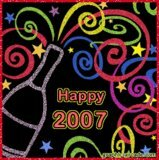 The older we get the faster it seems to go.I hope that 2007 brings all our family and friends Good Health. I thought I would post a few Irish Blessings for the end of the year. May you live as long as you want, And never want as long as you live. Always remember to forgetThe things that made you sad.But never forget to rememberThe things that made you glad.Always remember to forgetThe friends that proved untrue.But never forget to rememberThose that have stuck by you. Always remember to forgetThe troubles that passed away.But never forget to rememberThe blessings that come each day. May God be with you and bless you, May you see your children's children, May you be poor in misfortune, rich in blessings.May you know nothing but happinessFrom this day forward. May the road rise to meet you.May the wind be always at your back.May the sun shine warm upon your face.And rains fall soft upon your fields.And until we meet again,May God hold you in the hollow of His hand.